BRYAN EATON/Staff photo. 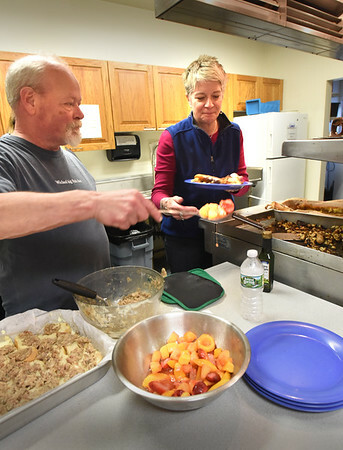 Volunteer Richard Allen and Lisa Crocetti load a plate with breakfast casserole, sausage and fruit salas at St. Paul's Church in Newburyport yesterday morning. The church also put on a ham supper last night for those in need or in want of some fellowship.